The Global Exploration Roadmap, 3rd edition build on previous versions for moon and Mars exploration. Credit: ISECG. 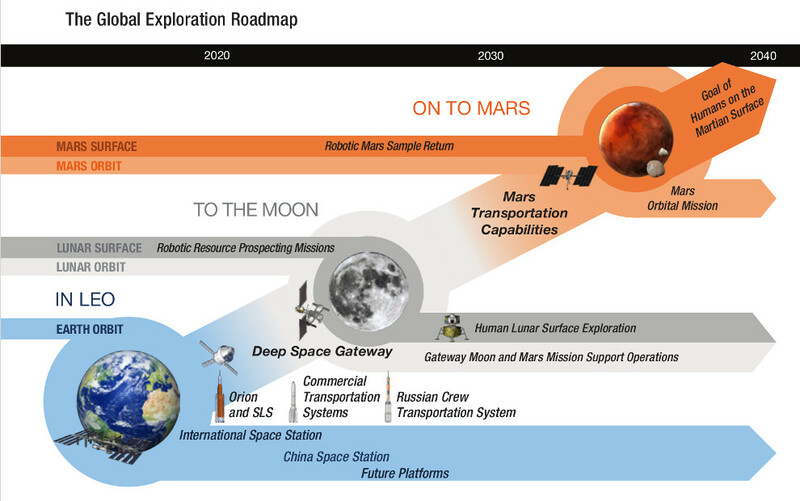 The International Space Exploration Coordination Group (ISECG) has released the third iteration of its Global Exploration Roadmap with some important changes including the moon as an important step and the increased role of the private sector. The Global Exploration Roadmap is the product of 15 national space agencies which includes the Canadian Space Agency. However, it appears not every member endorsed the updated roadmap. The German Aerospace Center (DLR) logo does not appear on the new roadmap. The omission is not a mistake. The reason for the DLR not officially endorsing the report is unclear. SpaceQ contacted the DLR but has yet to hear back at time of publishing. The countries and their respective space agencies that make up the ISECG that have endorsed the new roadmap include Australia, China, France, India, Italy, Japan, Russia, South Korea, Ukraine, United Arab Emirates, United Kingdom, and United States as well as the European Space Agency. Global Exploration Roadmap. 3rd edition. Credit: ISECG. Canada has already discussed its preliminary DSG ideas and has been seeking input from the Canadian space community. As a precursor to the roadmap release, earlier in January the ISECG released a white paper which outlines the “Scientific opportunities enabled by human exploration beyond Low-Earth-Orbit.” The paper includes substantial contributions from Canadians. ISECG Mission Scenario. Credit: ISECG. Learn more about living in deep space. Operate robotic missions to and on the lunar surface. Stage crewed missions on the lunar surface (Human Lunar Lander). Enhance science of the Moon and the Solar System. Assemble and check-out of the transport vehicle to Mars. Prepare and test mission operations for subsequent human exploration of Mars and/or long-duration human activities on the Moon. Understand the potential economic implications of lunar development and/or commerce. The roadmap also cites the importance of private sector initiatives and new partnership opportunities. The table below outlines the critical technologies identified by the ISECG. Critical technologies identified in the Global Exploration Roadmap. Credit: ISECG. Mars is not forgotten in the updated roadmap. 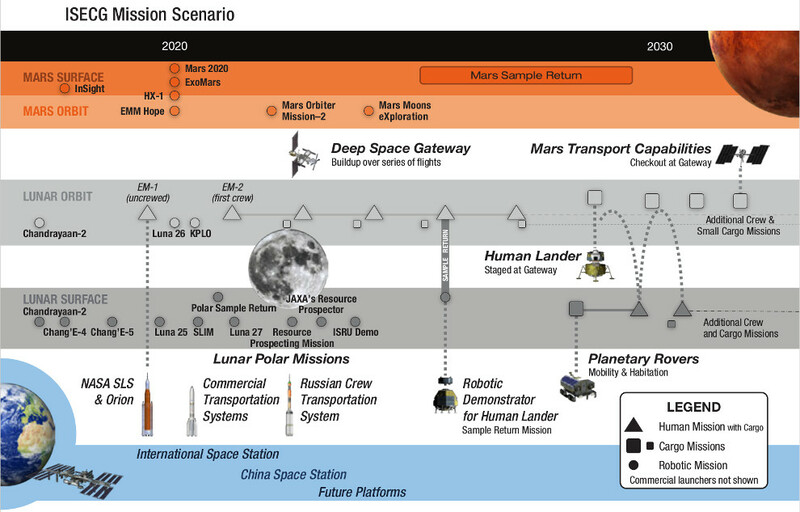 Future Mars Robotic Missions. Credit: ISECG. It’s clear that between 2013 and today, the Global Exploration Roadmap has evolved to take into account the realities and limitations of national space programs, the difficulties of sending humans to Mars directly, and the challenges that are still ahead. Those in favour of a direct path of humans to Mars will be disappointed. It seems the way to Mars will include a stop at the moon. The only current scenario that could see a direct path of humans to Mars in the 2020’s would be if SpaceX, with its stated goal of human settlement of Mars, makes a real and credible push that convinces both NASA and Congress. 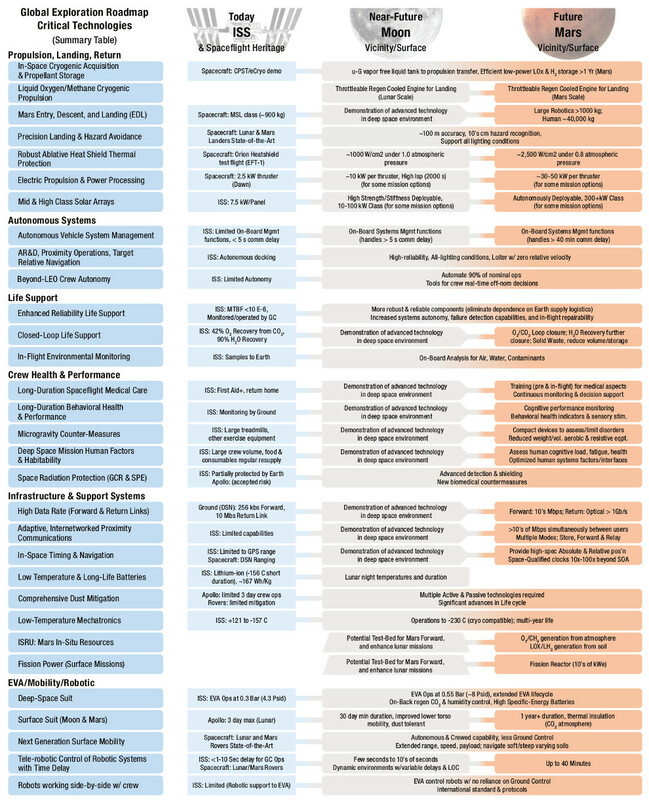 You can download the ISECG roadmap here.